PRO: Signed with the Riders as a free agent in February, 2012…selected by the Winnipeg Blue Bombers in the 1st round (6th overall) of the 2008 CFL Draft. 2018: Started 18 regular-season games and the Western Semi-Final…played 15 games at left guard and four games, including the playoffs, at centre…named CFL All-Star…named West Division All-Star…named Riders’ Most Outstanding Offensive Lineman. 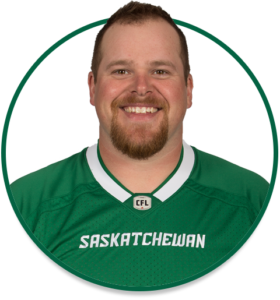 COLLEGE: Played for the University of Regina…in 2007 started all 10 games and was an integral part of the offensive line which helped the Rams average a Canada West Conference leading 32.1 points per game…also participated in the East-West Shrine Game that year and played in the East-West Bowl.